We reported last year on the dramatic growth in enrolment in international schools – that is, those primary and secondary schools that offer a curriculum different than that of the country in which they are based. The International School Community blog notes that global enrolment in such programmes has grown dramatically over the past decade and more, rising from roughly one million students in 2002 to more than three million by 2012. The UK consultancy ISC Research estimates that there are more than 6,500 English-medium schools worldwide, nearly half of which (3,292) are British. ISC Research Chairman Nicholas Brummitt has projected that by 2024, there will be over 12,000 international schools teaching 6.9 million students generating an annual fee income of over US$62 billion (£37 billion). These broad market trends are front and centre this year in an annual survey that provides both a detailed snapshot of international student enrolment in British independent schools as well as the continued expansion of overseas campuses for UK-based schools. The latest census conducted by the Independent Schools Council (ISC) in January 2014 gathers responses from all 1,257 ISC member schools. The ISC census finds that among member schools there are currently 24,391 non-British students enrolled whose parents live overseas – representing roughly 5% of the total enrolment of ISC members – as well as a further 11,329 foreign students whose parents live in the UK. The census indicates as well that a majority of foreign students in British independent schools enrol in their last two years of secondary studies (54.4%), choose co-ed schools (80.9%), and attend as boarding students (91.3%). Of the nearly 25,000 international students whose parents live overseas, almost four in ten come from China (19.3% Hong Kong, 18% Mainland China). A further 10.4% come from Russia, with Germany (8.2%), Spain (5.1%), Nigeria (4.1%), Thailand (2.4%), and Malaysia (2.3%) rounding out the top source countries. As the following chart illustrates, the enrolment base for independent schools in the UK has shifted over the past several years with greater proportions of students coming from both Mainland China and Russia from 2007 onward. In addition to such detailed findings on the international enrolment base at independent schools in the UK, the census also highlights a rapid expansion in the overseas campuses for leading British schools. Indeed, the number of overseas campuses of ISC members has nearly doubled over the past two years, and offshore enrolment will shortly exceed the number of international students attending independent schools in the UK. 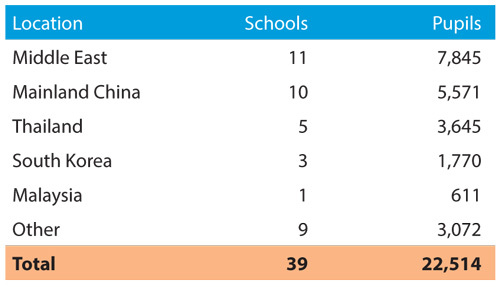 The following table summarises the locations for the 39 offshore campuses reported by ISC members for 2014. For additional background, please see a summary infographic for a helpful snapshot of independent schools in the UK as well as the complete ISC census report for 2014. This entry was posted in Europe, K-12, Most Popular, Regions, Research, United Kingdom and tagged infographic, branch campus, student mobility, student enrolment, international students.